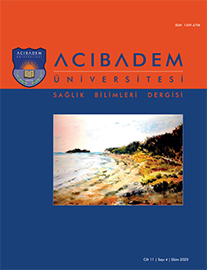 2Ondokuz Mayıs Üniversitesi Sağlık Bilimleri Fakültesi, Beslenme ve Diyetetik Bölümü, Samsun, Türkiye DOI : 10.31067/0.2018.20 Aim: It was aimed to investigate the effect of health education on nutritional status and healthy life style behaviour among university students. Study Design: A total of 421 students were enrolled to the study attending first and fourth-year classes of Medical Faculty and departments of Nutrition and Dietetics, Nursing and Midwifery of a state university. Healthy Lifestyle Behaviors Scale (HLBS) II was applied to all students along with a questionnaire consisting of questions about sociodemographic characteristics of the students. Statistical analyses were performed at the SPSS 21 programme with One Way Anova and Independent Sample T tests. Results: Male and female ratios were 21.4% and 78.6%, respectively. The students" mean age was 20.64±1.78 years and Body Mass Index was 21.83±2.98 kg/m2 . Nutrition and Dietetics students had higher scores at total HLBS and Health Responsibility, Physical Activity and Nutrition subscales were higher (Nutrition and Dietetics students" scores were higher for total HLBS and subscales Health Responsibility, Physical Activity and Nutrition) than students of other departments. Nutrition and Dietetics and Midwifery students had higher scores at Spiritual Development subscale and Midwifery students had higher scores at Interpersonel Relationships subscale than other students. While Stress Management subscale scores were higher for first-year students; Health Responsibility, Physical Activity and Nutrition subscales and total HLBS scores were higher for fourth-year students. The lowest score was taken from the subscales Physical Activity; the highest scores from the Spiritual Development scale. While Health Responsibility, Interpersonal Relationships and Nutrition subscale scores of girls were higher than male students" scores; Physical Activity subscale scores of male students were higher than girls" (p<0.05).